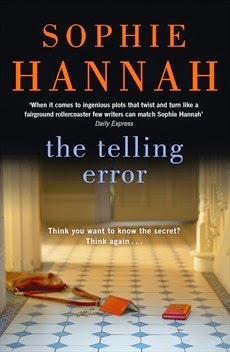 I'll admit it, before I even read Sophie Hannah's The Telling Error I was already impressed by its clever title. On her way to her son's school Nicki Clements gets stuck in traffic in Elmhirst Road. Looking ahead, she sees a police officer she's seen before, and doesn't want to encounter again. Doing a U-turn, Nicki heads away, only to find herself brought in for questioning the next day about the murder of controversial newspaper columnist Damon Blundy, who lived in Elmhirst Road. While she may not have murdered Blundy, Nicki's got secrets she needs to keep. This is the first time I've read a book by Hannah, and it's most definitely not going to be the last. The Telling Error is a clever, tautly plotted crime thriller which explores so many issues pertinent to modern day life - the encroachment of the internet, the influence of newspaper columnists, the importance yet impossibility of complete anonymity, the public's relationship with the police. It's important to note, though, that Hannah has managed to build a story around these issues in a way that in 10 years time, this book will still feel fresh and relevant. The Telling Error opens with the text of an advert placed on a personals site called Intimate Links (again with the clever name). Only this advert isn't from a man looking for a woman for romance or something else, it's from someone advertising themselves as a secret keeper, and asking for anyone who knows intimate details about the murder of Damon Blundy to come forward. It's a clever tool, thrusting the reader right into both the narrative and the mystery of the story. Hannah also intersperses the main prose with columns written by Blundy, who is the columnist you'd get if you merged Richard Littlejohn with Liz Jones with Katie Hopkins wth Jeremy Clarkson, as well as emails to and from Nicki. Oh, Nicki. What a character. She simultaneously evoked pity and rage in me, the rage mostly coming from how frustrating I found some of her actions. A wife and mother, Nicki seems to have everything going for her - a lovely husband and two gorgeous children. But as the novel unfolds we learn that her best friend, her brother and her parents have been partially responsible for making Nicki the way she is (bit vague, but I don't want to spoil it), and that she's almost two people. Hannah's decision to keep Nicki as she is, right to the every end of the last time we see her, is absolute genius, and I found my mouth dropping open in both surprise and resignation when I read the last sentence from Nicki's point of view. As I said earlier, this is the first book I've read by Hannah, but it's not the first book she's written featuring police officers Simon Waterhouse and Charlie Zailer, although I didn't know that when I first started reading. However, I soon guessed I'd missed something, but I didn't feel like that meant I couldn't understand or enjoy the book. The Telling Error is a brilliant book, which I urge you to read. If you're anything like me, you'll devour it in just a few hours, so make sure you have no plans when you start reading. How I got this book: From the publisher, Hodder & Stoughton. This did not affect my review.